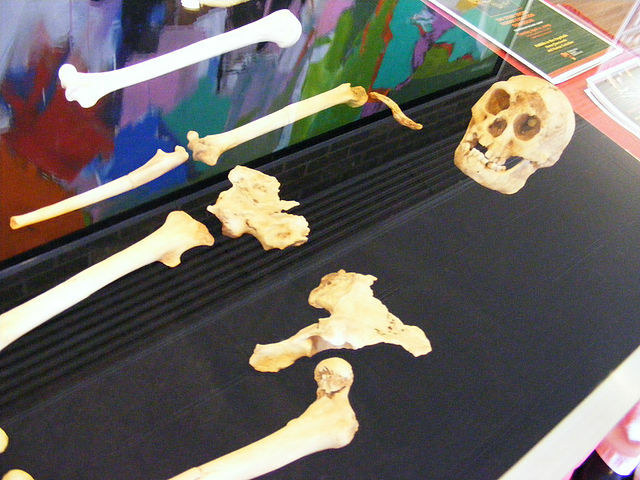 An article published in the magazine “Journal of Human Evolution” describes a study on the bones of Homo floresiensis (photo ©Mamoritai), the hominids nicknamed hobbits discovered on the Indonesian island of Flores in 2003. A team led by the Australian National University (ANU) concluded that it was probably a sister species of Homo habilis, that there was no evidence that it evolved from Homo erectus and that it’s almost impossible for it to be Homo sapiens suffering from malformation. The discovery of fossils belonging to various individuals of a hominid a little more than a meter tall in a cave in Liang Bua on the island of Flores made the news also because its discoverers nicknamed them hobbits because of their height. The discovery also triggered arguments to try to figure out these hominids’ origins and their relationship with modern humans and their cousins. Three theories on the origin of Homo floresiensis were offered. According to the first theory, Homo floresiensis evolved from a population of Homo erectus, whose presence in Asia was known, who emigrated to the island of Flores. According to the second theory, Homo floresiensis evolved directly from an ancestral species of the genus Homo emigrated from Africa. According to the third theory, Homo floresiensis is not a valid species but the individuals identified as such were actually Homo sapiens who suffered from some genetic or metabolic disease. Debbie Argue of ANU’s School of Archeology & Anthropology led a team that analyzed a set of characteristics of the Homo floresiensis’ bones discovered. This is a study more complete than the others previously conducted that focused mainly on their skulls and jaws. Over the years, a number of team of researchers came up with different and conflicting conclusions so the analysis needed to be really thorough to get convincing results. According to this new research conclusions, Homo floresiensis was probably a sister species of Homo habilis, which means that these two species evolved from a common ancestor. It’s not currently possible to say whether Homo floresiensis evolved in Africa to migrate to Asia or the common ancestor with Homo habilis migrated to Asia and evolved into Homo floresiensis there. It’s possible that Homo floresiensis or its ancestors lived in various areas of Asia and then got replaced almost everywhere after the arrival of Homo erectus. The island of Flores may have been the last place where that evolutionary lineage of hominids survived until just over 50,000 years ago. This research is unlikely to be the last word about Homo floresiensis. Perhaps the conclusions on his relationships with other hominids will be accepted after being analyzed by other paleontologists but at best there’s still the problem of where the “hobbits” evolved.